Get Ahead In Heads-Up Poker! How To Get Ahead In Heads-Up Poker! If you’re a regular poker player then it is likely that you have come across heads-up poker at some point. Some players choose to play special heads-up games (one on one poker) while others simply find themselves in the position accidentally. Often you can be the last person standing in a tournament and find yourself head to head with another player, or in a cash game where other players have decided to leave. Whether you choose heads-up poker games or have found yourself in this situation at the end of the tournament, knowing some heads-up poker tips can be very beneficial. When in a heads-up situation, aggressive play is usually the key to success. Since you are up against only one other opponent, your hands are of greater value. For example, simply having an ace in your hand can be of tremendous value. In fact, your chances of winning against any non-paired hand will be at least 52 percent without even taking into account your second card. With this in mind, it is recommended that you raise and play aggressively if you hold an ace in your hand. Although this is not a good idea when playing at a full table, in heads-up play it can massively increase your chances of walking away from the table as the victor. When you are hitting either small or big blind on every hand it can be very tempting to play through the round. Doing this can actually make you worse off, especially if you are calling the big blind just for the sake of it. Furthermore, folding the small blind makes your opponent think that you will only play good hands. You shouldn’t fold every hand either but be selective and unpredictable to your opponent. Many people will play every hand in a heads-up game. The best position to be in when playing in a heads-up game is small blind. This position allows you to call the shots and put pressure on your opposition by raising often. Being in this position gives you more control of the pot after the flop and if you play right, you are more likely to win pre-flop by raising. You should be aware thought that many players will use position to their advantage use this strategy against you when they are in position. This means that in these situations you should raise if you have an ace or face card. Playing like this will benefit you later in the game if you have a good hand when you are not in position. In this situation, your opponent will usually call anything that you bet, thinking that you are playing back at them for being in position. One benefit of playing one-on-one is that you only have one player to keep track of. 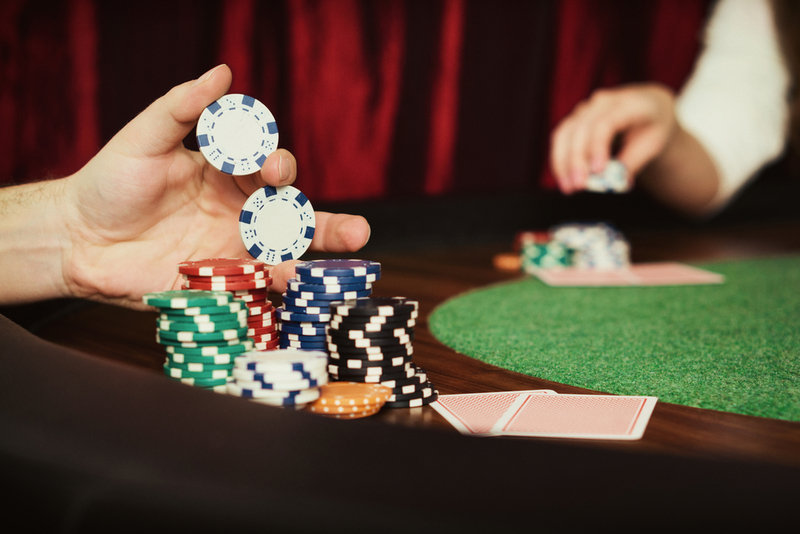 When playing on a full table, it is much harder to spot bluffs and figure out the betting strategies of other players. When playing heads-up, keep an eye on any drastic moves that your opponent makes and what the outcome of these are. This way, it’ll be much easier for you to determine when they are bluffing. If you can figure out your opponents tactics early on, you will be at a significant advantage for the remainder of the game. As you will be keeping an eye on your opponent, the chances are they will also be keeping an eye on your play. Avoid making the same moves too often and make yourself as unpredictable as possible. For example, if you have raised pre-flop for the last three rounds, then consider checking and betting on the flop, checking on the turn, and betting on the river. The more varied your bets are, the harder it will be for your opponent to read you. Although it can be tempting to bet as much as possible when you have a great hand, it’s a good idea to rein it in a bit sometimes and think of the end result of playing strategically. Poker is a game of strategy, by making yourself too predictable your losses can be devastating, always play tactically. The key to being successful in a heads-up game is knowing what your hand is worth. Check the archives on this site for more articles that discuss the weighting of different poker hands. Poker is far from the only way to win (or lose) money gambling online!